As evening twilight darkens the July sky, a brilliant orange star rises in the southeast. This is actually not a star, but the planet Mars. Over the next 2 months, Mars will be brighter and closer to Earth than at any time since year 2003. In fact, Mars, despite being only about half Earth’s diameter, is now brighter than the giant planet Jupiter, and will remain so until mid-September. For over a century, Mars has excited us, initially as a possible abode of life, and more recently as a place to explore and perhaps colonize. Mars is the most “Earth-like” of the other planets in our Solar System. We know that Mars has a thin atmosphere and polar ice caps composed mostly of water ice. Mars also has volcanoes, ancient river valleys, and intriguing organic compounds. And there is underground water ice on Mars, and possibly underground liquid water, too. But there’s a lot we must learn about Mars before humans can live there. Is sufficient water available in the warmer parts of the planet? Can oxygen for breathing and methane for rocket fuel be produced efficiently from Martian resources? Can crops be grown on Mars? Do biological hazards exist? In the next several years, space probes from NASA, the European Space Agency, and others will be seeking answers to these questions. And, in following decades, space agencies and entrepreneurs alike plan to start exploring Mars in earnest. But for now, go out in the evening to see and contemplate brilliant Mars. Better yet, join the Black Canyon Astronomical Society and rangers at Black Canyon of the Gunnison National Park to view Mars through telescopes. 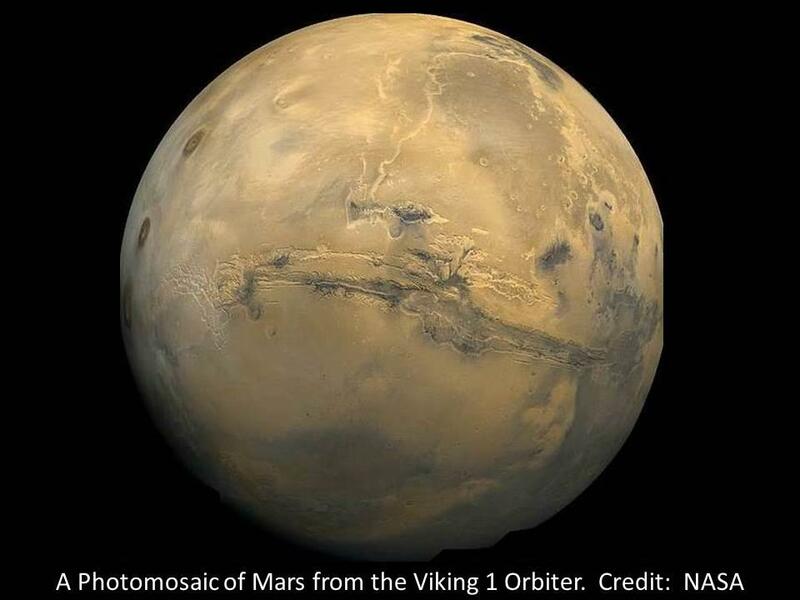 In coming weeks, telescopes may reveal many features on Mars especially well, for example, its south polar ice cap, its cloudy polar hood, and its dark-colored terrains, like the shield volcano called Syrtis Major.